CINCINNATI -- Angered by leaks and what he called a "rogue element" within the Cincinnati Police Department, City Manager Harry Black said Wednesday he'd be asking the federal government to investigate. People in that same "rogue element," Black said, are trying to be disruptive and insubordinate because they have to work for an African-American police chief and city manager. "It's not even a handful of individuals that fall into this fringe category," Black told reporters. He made the allegations not long after Capt. Bridget Bardua claimed Assistant Chiefs David Bailey and Paul Neudigate, as well as Capt. Jeffrey Butler, are working behind the scenes to oust Chief Eliot Isaac . 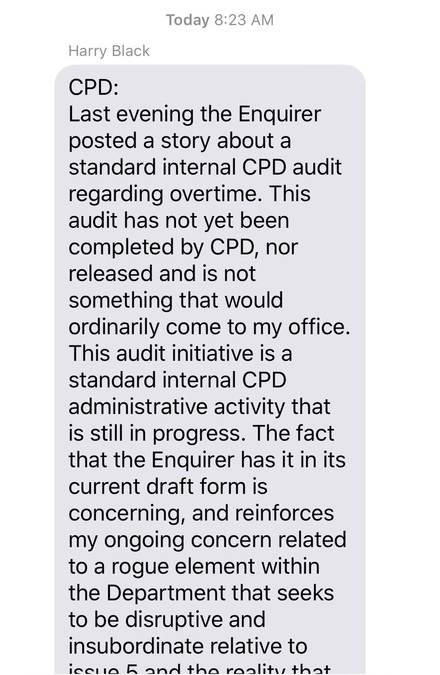 Black's anger focused on a draft overtime audit -- conducted by Butler's team and detailed in a memo from Bailey -- that was leaked to the Cincinnati Enquirer. In an email to Mayor John Cranley and council members, Black said he wanted the U.S. Attorney's Office to look into corruption within the police force. He did not name anyone specifically. Problems include misuse and abuse of authority, Black said. He told reporters he hadn't yet contacted the feds as of Wednesday afternoon and was working with the city's law department to figure out what was next. Screenshot of text message sent to elected officials Wednesday morning. "Corruption is a very serious charge and we must be vigilant about it if it is true," Cranley wrote to Black. "Who is corrupt and what have they done? Please share with us any and all elements of corruption you are aware of." "The statement that there is a rogue element within the police department is a very serious allegation, and it's one that should be backed with some sort of evidence," local Fraternal Order of Police president Dan Hils said. The draft audit came to light a day after Bardua, who commands District Five, made a sexual discrimination complaint to Isaac and the U.S. Equal Employment Opportunity Commission. In that complaint, she detailed her allegations against Bailey, Neudigate and Butler. Among other things, Bardua alleged overtime rules seemed to change arbitrarily when she took command of District Five -- a district Bailey and Neudigate once supervised. The draft audit found Bardua herself was one of the main beneficiaries of overtime, working 1,054 hours and receiving $82,723.13 last year. That's the highest amount of any captain. Sgt. Jason Voelkerding, who works for Bardua and co-signed her complaint to Isaac, worked 2,164 hours of overtime and received $126,225.67 -- which, according to the audit, would make him the highest overtime pay earner in the department. Three of five sergeants with the most overtime pay worked in Bardua's district. The audit claims some officers game the system to maximize their pay. Bailey didn't direct that accusation at any individual. Cranley asked Black to release the document publicly Wednesday, and WCPO obtained a copy from the city manager's office. Black and Isaac insisted, however, that it was incomplete, and that a figure cited in the Enquirer's report was inaccurate. Isaac said his department's financial manager wasn't consulted and didn't get a chance to verify the audit's numbers. He also expressed frustration that two confidential documents had been released to the media in the past three months without his approval. Both were under the oversight of the Administrative Bureau, Isaac said. Though the chief didn't name him specifically, Bailey is in charge of that bureau. "This continues to be a concern and hinders the operation of the agency," Isaac wrote. In his text message, Black accused the Enquirer of being "complicit in this behavior." Its editor defended the reporting. "The only thing we are complicit to here is making the public aware of how its tax dollars are being spent," Beryl Love said. Another audit of police overtime, released in 2016 , found significant gaps in oversight, including a lack of proper approval for overtime hours and instances of officers taking paid time off and then working overtime assignments in the same timeframe. In that report, Bailey said former chief Jeffrey Blackwell allowed "unlimited overtime opportunities with little or no review." Black cited similar problems in a Sept. 9, 2015 memo announcing Blackwell's termination. Bailey claimed those practices had been eliminated. But Bardua claimed Isaac's job may be on the line like Blackwell's was before. In her complaint, she said Butler showed up at her house earlier this year, apparently upset about the most recent overtime audit. Bardua alleged Butler told her she or Isaac "will not survive this. It's either you or him.'" Brian Gillan, attorney for Butler and Bailey, denied the men were trying to force Isaac out of office. He also said the pair called the discrimination complaint "baseless" and believe it will be dismissed. Butler helped Bardua study for her captain's exam and has "always been a friend and supporter," Gillan said. Wednesday's tension is just the latest in a string of controversies swirling around the police department generally, and District Five specifically, over the past few months. Others have alleged the department treated its 911 center as a "dumping ground" for sergeants who couldn't cut it in the field; that City Manager Harry Black retaliated against Butler for questioning how the city spends 911 money and grants; and that District Five headquarters was a health hazard. In the final case, a federal agency reported last week there's no reason to believe the building was tied to cases of cancer among police union members.